I am totally convinced that the we’re all living in a socially constructed world – ever since I read the seminal Peter Berger and Thomas Luckmann 1966 classic at university – and that the media play a central role in that construction. I’m equally convinced that this is an inescapable reality. Although I make an effort to be a discriminating and critical news media consumer, I don’t try to actively shield myself from the deluge. Whatever I’ld do, I would end up in a socially constructed universe anyway, and on top of that: news is like nature (it actually is because whatever we produce is nature), lots of weeds cluttering our passage through it, but who’s to deny the many fruits, flowers and other beauties popping up in between, and even more fundamental: one person’s weed is another’s food or medicine or eye candy. The photographer has taken pictures of people for two years now, all over the world…Dass takes a pixel of someone’s skin, matches it with the colour of the Pantone colour coding scheme that is being used by printers and graphic designers. That colour is then used as the background for the picture. Dass started her project…with photographing her family members, but has already two thousand people in her database. The beauty of the [ongoing] project is that if you see all those different pictures together, the huge diversity and nuances of skin colours become evident – also if you only look at ‘white’ people. Have a look at her tumbler page! It’s a fascinating viewing experience. What struck me, and enticed me to share this find, is the simplicity of it. A very basic reality: “Humanae is a pursuit for highlighting our true color, rather than the untrue red, yellow, black, and white,” Dass says. Has no one thought of this before? Humanae re-interpretado en clase por los alumnos de 4º de primaria del CEIP Ferrández Cruz en Elche (Alicante) , España. 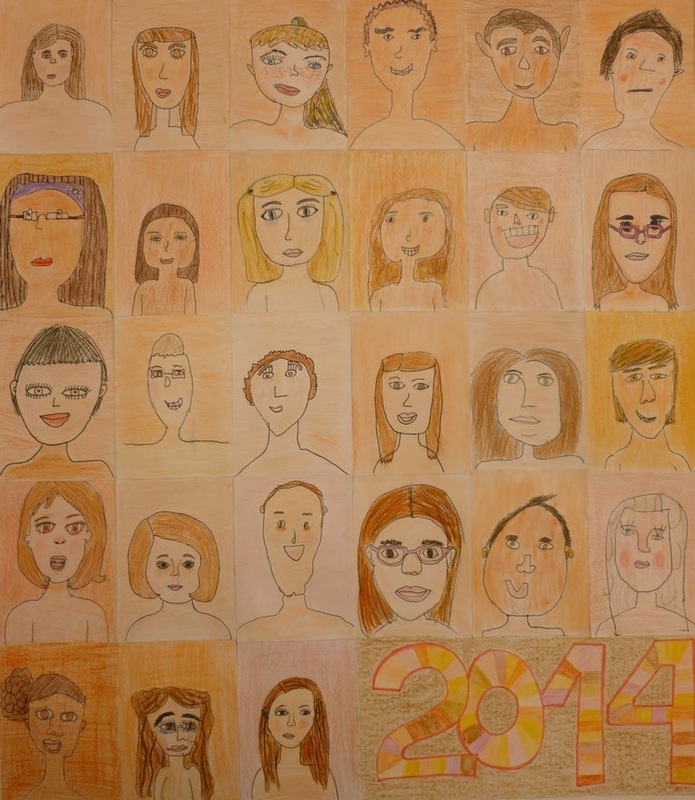 It comes from this great blog of a primary school librarian in Alicante (Spain). It has the sign of quality all over it: one simple but amazing thought, and its hauntingly beautiful execution, inspires another creative mind, to do translate it to her own surroundings, which makes for great education, and urges me again to share it, so that you can enjoy it in turn and go with it, for whatever it can do for you. This entry was posted in society and tagged Angelica Dass, creativity, educational philosophy, information assessment, skin colour. Bookmark the permalink.